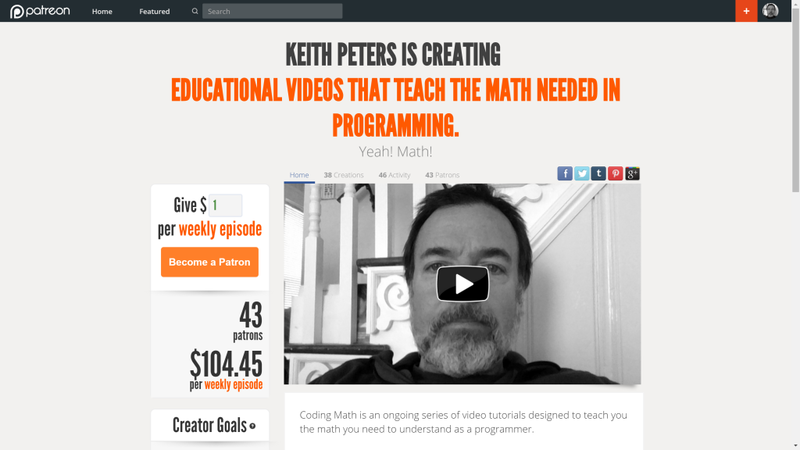 Coding Math is free, but any support you want to give is most welcome. You can sign up at Patreon.com to pledge any amount you want per video. Or, if you want, you can do a one time donation with PayPal. Or, just stuff wads of cash in an envelope and send it to me. Dear Sir, I have been following all your videos and have enjoyed them very much. Thank you for donating your time to help educate us in learning to code graphics. I am very new to programming and am having a difficult time writing code for my project. I was wondering if you would be available for hire for a small project, I’m thinking 8 hours. This project is purely for my own interest and it’s not to make money, however, it is still something I would be willing to pay for. I’m not sure if I can even afford you, but if you are available, kindly reply with your hourly rate and I will give you more details. Your maths videos are amazing, I have found other examples so hard to follow but yours is a breeze, I’m a windows forms developer, but I’ve always want to code small games your examples have helped; talking about examples I’ve coded several plus of your examples in the .Net framework, could I give them to you to post on your github for example for others to follow.